In the coming weeks our Year 10 students will participate in the Creating Flexible Futures, a new program that has been developed to assist students with their transition into their senior years of study at Loreto Normanhurst. 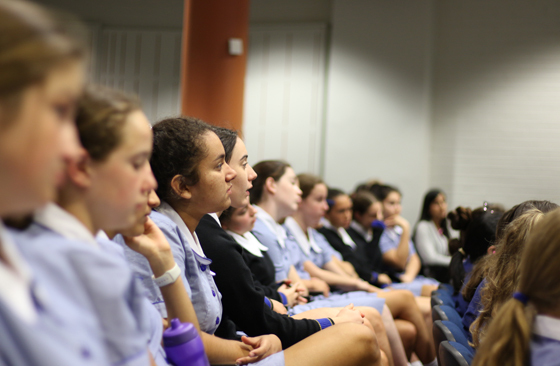 The first component of Creating Flexible Futures is the YCON program – which has been a pivotal element of the Year 10 curriculum for many years at Loreto. YCON encourages our students to develop an understanding of global issues and an appreciation of their power to make a difference both locally and globally. At the conclusion of the YCON program students will participate in a session where they will be invited to reflect upon their own lives and their skills/passions/interests in relation to the issues they have explored during the YCON program. They will be challenged to reflect upon these skills/passions/interests and consider how they might harness their own potential to make a difference in the world beyond the gates of Loreto. The students will then embark on the LAUNCH program in Weeks 8 and 9, completing a series of workshops in their House groups on Monday 27 November and Tuesday 28 November. The content of these workshops will focus on the key aspects of the program – LEARN, ACT, UNDERSTAND, NAVIGATE, COLLABORATE and HOPE. At the conclusion of the two-day workshops the students will then sample the Stage 6 timetable. Students will be challenged to consider if the subjects they have chosen align with the skills and interests that most resonated with them throughout YCON and the LAUNCH workshops. On the final day, Thursday 7 December, a guest speaker has been engaged to challenge the students to harness their own potential to make a difference in the world. Students will be provided with an opportunity to reflect upon the Creating Flexible Futures program to further articulate their own vision and their sense of PURPOSE. We wish Year 10 well as they move into this next exciting phase of their learning.